Now we're done let's put the whole thing together using an HTML table. (If you don't understand HTML then get yourself a good HTML Tutorial). I've created a table which is 300 pixels wide. 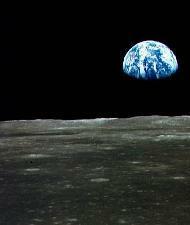 This is deliberately the same width as my original earthrise.jpg background. Within the table, I've created a three cells laid out in a row. This is so each cell can accommodate one of the three segments from earthrise.jpg that I created in the previous chapter. The first cell in the row is 190 pixels wide, the same width as earthrisel.jpg. I've also set earthrisel.jpg as the background for that cell, and then centered the buglegs.gif animation on of it. The second cell in the row is 10 pixels wide, the same width as earthrisec.jpg. In this case, I've placed earthrisec.jpg as an image within the cell, specifying its width and height (10 and 225 pixels respectively). Creating at least one cell like this, with a segment of the background as cell contents (rather than as a cell's background) is essential because it ensures the whole table will be made high enough to fit in the whole of the background. This is because the height of the table row is determined by the height of the tallest item in the row (so if earthrisec.jpg had been placed in the background of this cell, the row would be the larger of the heights of buglegs.gif and snorkel3.gif, namely 200 pixels, which would result in our 225 pixel high background being truncated at the bottom). The third cell in the row is 100 pixels wide, the same width as earthriser.jpg. I've also set earthriser.jpg as the background for that cell, and then centered the snorkel3.gif animation on of it. So what does the finished result look like? I'm pretty happy with that!